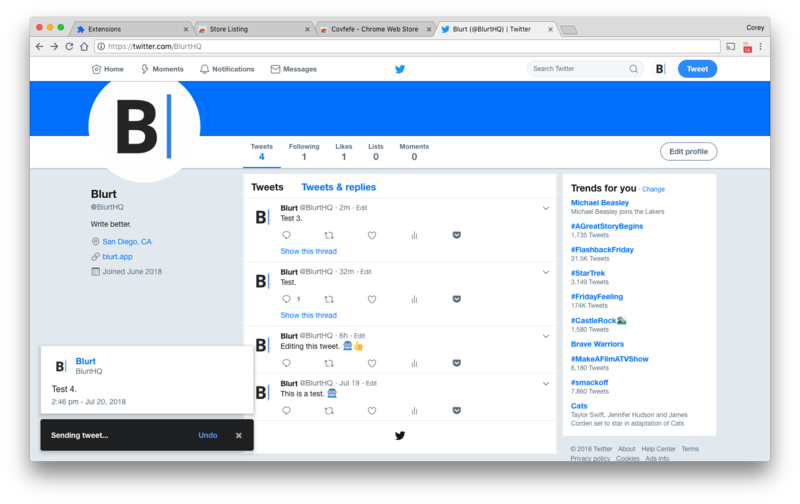 Edit Typos in Your Tweets Using This Chrome ExtensionFor someone who writes for a living, my Twitter feed has an embarrassing number of typos. I typically notice them the second after I hit post, and am immediately faced with the decision "Do I delete this tweet and pretend it never happened or just roll with the typo?" Someone finally made a simple way to edit your tweets, inspired by President Trump's famous 'covfefe' typoFor years, Twitter users have been begging Twitter CEO Jack Dorsey to create a feature that would allow them to edit their tweets after publishing, and thus saving themselves from the embarrassment of a rogue typo, auto-correct mishap, or any other blunder that would ensue as a result of inadequate proofreading. Would you recommend Covfefe to a friend? This is a brilliant idea and an almost perfect implementation. I was in love with it until... I replied someone. Instead of keeping the thread, the extension makes a completely new tweet, just like I've @'d someone with no context. It also breaks RTs, replacing it with the "old-style" RT's. Fix this and it would be perfect. I really liked the idea, i know it's kinda tricky work around those "problems", but, for now, it's a no-no for me. Joselito Júnior has used this product for one day. Samuel O'sesin has used this product for one day. 👋 Hi PH! An edit button, finally! It's fantastic, really, it's quite amazing. A lot of people are telling me it's a pretty huge deal. So last Friday, @pugson and a few of us chatting over at WIP.chat thought delaying and undoing a tweet would be a nice compromise to the issue of not being able to edit them. Something like Gmail's undo send would be great. It got me thinking. I got to work. Ridiculousness ensued. Covfefe was born. Let me know what you think and if you have any questions! I also wrote about how I built it Covfefe for the curious makers. Cool concept, I really like this! It doesn't really "edit" the tweets, it actually deletes them and replaces them. Also doesn't handle replies well, only tags the person you were replying to. @corey_gwin you are the man!